LAS VEGAS--(BUSINESS WIRE)--VER, the leading global provider of production equipment and engineering support, announces their new Flex Solutions mobile truck service at the NAB Show. A new broadcast service, Flex Solutions specializes in HD multi-purpose support units and equipment rental. The support units are customizable and can accommodate any type of facility including remote production, edit facilities, reality show productions, and operations trailers. VER Flex Solutions has already supported Desert Trip, The CMA Awards, ABC's The View, American Ninja Warrior and Monday and Thursday Night Football. All mobile units have an HD infrastructure with multi-viewing monitoring and routing, and can be modified to meet the needs of specific productions. “I’m really excited to combine my years of broadcast truck experience with VER’s incredible engineering and equipment expertise. Flex Solutions gives us the ability to offer just the right mobile unit and complete it with the specified rental gear. Our clients have been pleased because this new model for truck services gives them exactly what they need and saves them time and money,” says Craig Farrell, VER’s Co-President of Flex Solutions. VER offers a choice of eight Flex Solutions models. The Flex 2 is a 53’ expanding trailer with a back storage area and lift gate. This multi-purpose unit can serve as a fully functional support space with HD viewing and monitoring throughout. Two flex rooms offer single front benches with wall monitors. The Flex 3 50’ single expanding unit delivers VER’s VIP treatment. The main viewing room provides three 65” viewing monitors and a Dolby 5.1 system. Finished with custom cabinetry, it features a built-in stainless steel refrigerator. The two private executive offices come equipped with coffee bars and refrigerators. For a 53’ single expanding support unit there’s the spacious Flex 4 which is a favorite for full production shows due to its unique feature rooms, edit suites, specialized technology and sub-mix rooms. The 48’ Flex 6 is a single expanding unit with movable walls that make it easy to customize for specific production needs. The Flex 7 50’ stage truck is an excellent platform for mixing broadcast with sponsorship opportunities. Formed from a stage platform, it works well as a host position. The Flex 8 53’ double expanding ops trailer is built with 4K infrastructure and features operating stations for up to twenty-four. Plus, an enclosed conference room in the center offers windows on both sides for a unique mobile production space. Another double expander is the 24’ wide Flex 10 trailer offering ample floorspace to accommodate multiple broadcasts. NAB Show attendees are encouraged to visit VER in South Lower meeting room S110LMR. The company also announced their new used-gear sales program which offers high-quality equipment at competitive prices. Learn more at https://www.ver.com/used-gear/. VER is a leading, global provider of production equipment and engineering support. With the world’s largest inventory of rental equipment, VER supplies the most advanced technology to a broad array of clients in the TV, cinema, live events, broadcast and corporate markets. Clients rely on VER’s depth of experience in Broadcast, Audio, Video, Lighting, LED, Cameras, Rigging, Media Servers, Fiber and more. With 35 offices across North America and Europe, 24/7 support, and unparalleled expertise, VER can support any live or taped production anywhere in the world. For more information on VER please visit https://www.ver.com. 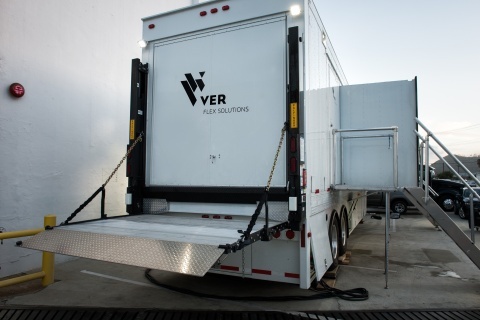 VER, the leading global provider of production equipment and engineering support, announces their new Flex Solutions mobile truck service at the NAB Show.